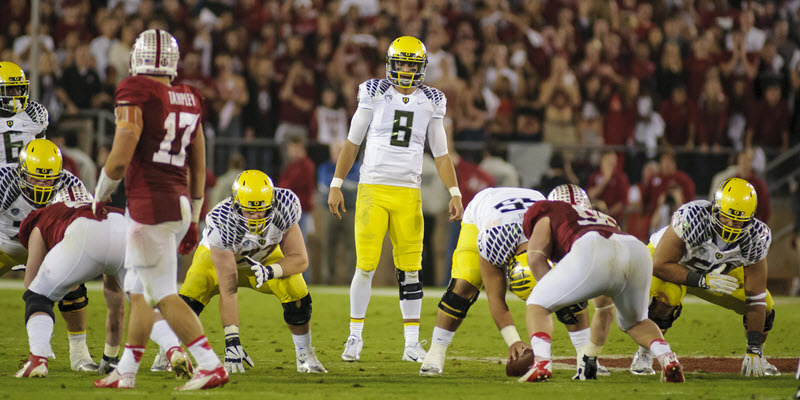 It may be a sad realization Duck nation, but Marcus Mariota is not coming back. If he were to do so for some reason, he’d be making the biggest mistake of his life. Mariota is coming off not only the best season of his career, but perhaps one of the best years in College Football ever. The redshirt junior accounted for 53 touchdowns on the year on his way to winning the Heisman Trophy, AP Player of the Year Honors and many other coveted awards after the end of the regular season. The Hawaiian led the Ducks to a Pac-12 Championship, big wins over rivals Arizona and Stanford and in his final two games scored 11 total touchdowns in big wins over ‘Zona and OSU. When Mariota won the Heisman it was by the second most decisive margin in Heisman history. In short, the guy has had a darn good year. Scouts and coaches around the NFL have Mariota on the top of their draft boards. If he doesn’t go No. 1 overall, it’s all but certain he’ll at least be in the top five. It’s Marcus Mariota’s time to go. Finally, Mariota has a shot at winning the National Championship this year, the inaugural College Football Playoff. If he and the rest of the Ducks are actually able to pull it off, Mariota’s stock will be at an all- time high. Although it will certainly hurt to see him leave, it will be equally satisfying to watch as one of the all-time great Ducks launches his undoubtedly successful NFL career. After a picture perfect season, Mariota will be able to finally be able to walk off the field as a champion. 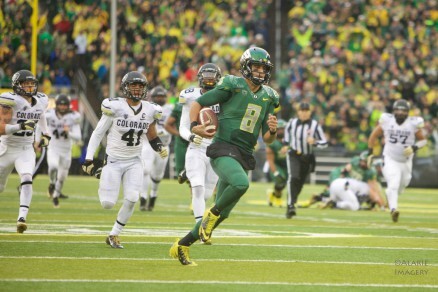 Selfishly, there’d be nothing more satisfying than seeing Mariota return and lead the Ducks one last time. He could dazzle the crowd at Autzen, maybe lead a game winning drive or two perhaps. But as both a lover of the Ducks and Mariota, I’ll cheer for him when he declares for the draft, when he’s chosen to an NFL team and finally I’ll cheer for him while he dismantles NFL defenses like we all know he can.